No matter if you’re in a serious long-term relationship, or married, it’s unlikely that you’ll never have arguments or experience a rift between the two of you every now and again. It’s important to constantly remind yourself of why the relationship started in the first place and the love that you have shared with each other. If you feel like you’re losing control, be sure to contact our office to schedule a time for couples counseling in Cockeysville. In this post, we’ll discuss the importance of couples/marriage counseling, and why going to therapy is a sign of strength, not of weakness. A big reason why couples, married or not, avoid taking couple’s therapy, is that they have a common misconception that going to counseling is the beginning of the end. This is entirely untrue. Relationships take work, and after years of being with one another, it can be hard to come to a resolution amongst each other when an argument arises. Going to therapy is not throwing in the towel, in fact, it’s quite the opposite. When you and your partner agree to seek guidance, it means that both of you care about the relationship enough to do everything in your power to save it. While other couples call it quits without trying anything aside from arguing with each other, they were likely not meant for one another. But when you commit to mending your problems, that shows determination and love. One of the most beneficial things about talking with Wendy Iglehart is that you are in a safe environment where you are both free to speak your minds. When couples argue, they tend to hold in some of the things that they really need to get out. Bottling your emotions only builds tension until you can’t take it anymore. This is never good. When going through therapy, it is highly encouraged to say what you need to say, without fear of going too far or experiencing retaliation before you express your feelings. 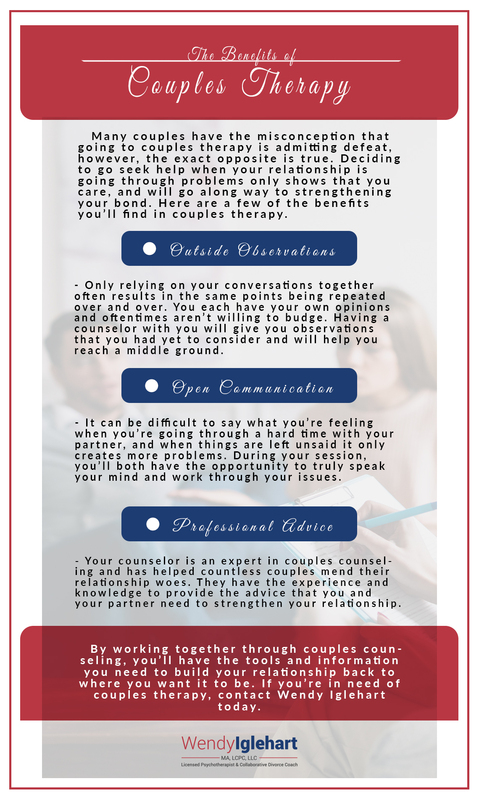 Another reason why couples or marriage counseling is beneficial is that you will receive advice from a certified therapist, but most importantly, a third-party observer. It is common when couples argue or experience separation that each party believes that they are right and are unwilling to admit otherwise. As stated before, when you visit Wendy Iglehart you’ll be in a safe space with no restrictions, and also receiving advice that you may not have thought of before. It’s extremely important to get an outside opinion and often leads to both admitting their faults or when they might be in the wrong. 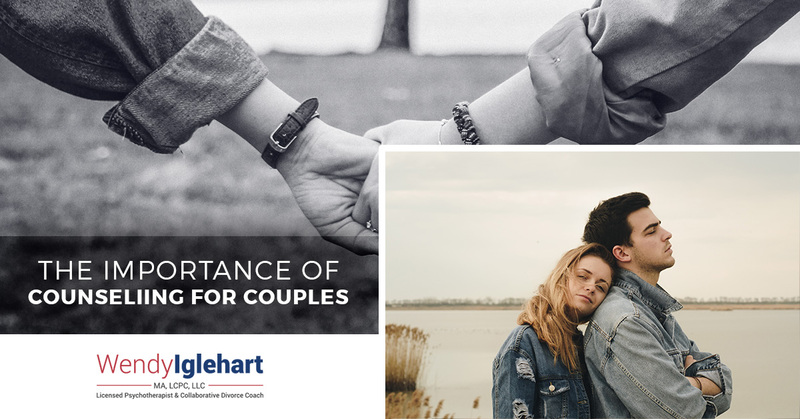 If you and your partner are experiencing difficulties, or would just like to strengthen your bond, don’t look at couples therapy as a last resort but instead a building block. There is nothing wrong with trying to better your relationship! If you’re ready to start today, be sure to contact our office and set up an appointment.